Dorm vs. Dorm – Who is the Greenest? Davidson College is implementing many sustainability initiatives in an effort to reduce its greenhouse gas emissions and energy costs. Claire Naisby, the college’s energy manager, worked to follow through on a dream she heard David Holthouser, Director of Facilities, talk about for years. 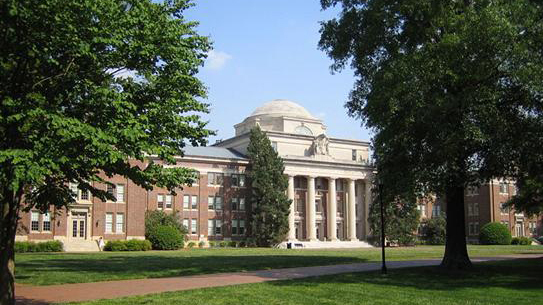 After extensive research Claire came across the Jessie Ball DuPont fund offering grants for sub-metering and energy conservation: a perfect opportunity for Davidson College. Sub-metering lets building managers observe specific consumption rates of utilities, at a much greater resolution than the base meters. This level of analysis allows for better planning and consumption for the future. Without sub-meters, organizations can see only their comprehensive energy use in any given time period. “Working with David Holthouser, we created a project to validate this concept,” said Naisby. Naisby and Holthouser well understood that Davidson needed more discrete information to determine how the totalized bills are derived, and sub-metering would provide more thorough reports. Davidson didn’t have any pre-existing sub-metering, so the installation of electrical and water sub-meters in 12 residence halls was the first priority. “These new meters will allow us to see how much energy is being used in each residence hall. After we find cost and energy savings through this new approach to monitoring our energy use, we hope to expand to all buildings on campus,” Naisby says. Activelogix was hired by Davidson to provide a dashboard solution to identify the various energy needs once the sub-meters were installed. 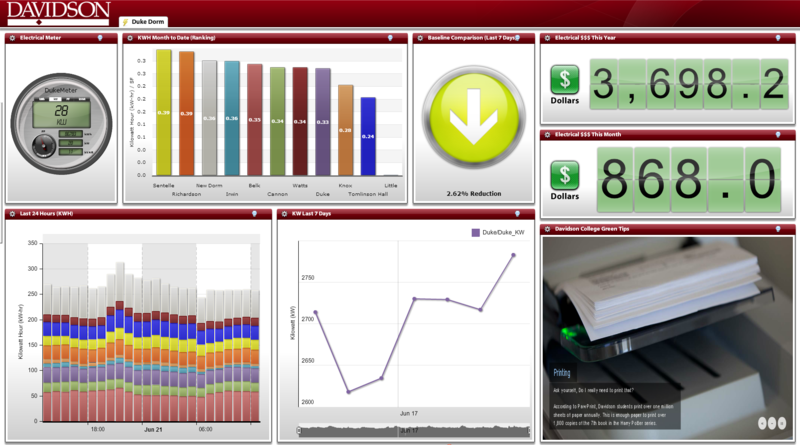 PeriscopeTM, along with a custom built interactive energy dashboard was chosen as the most cost effective solution backed by great support, technical guidance, and reliability. The ability to add additional meters and buildings into existing dashboards easily and cost effectively as well as the ability to customize individual dashboard displays based on desired parameters and user responsibility was an additional plus. 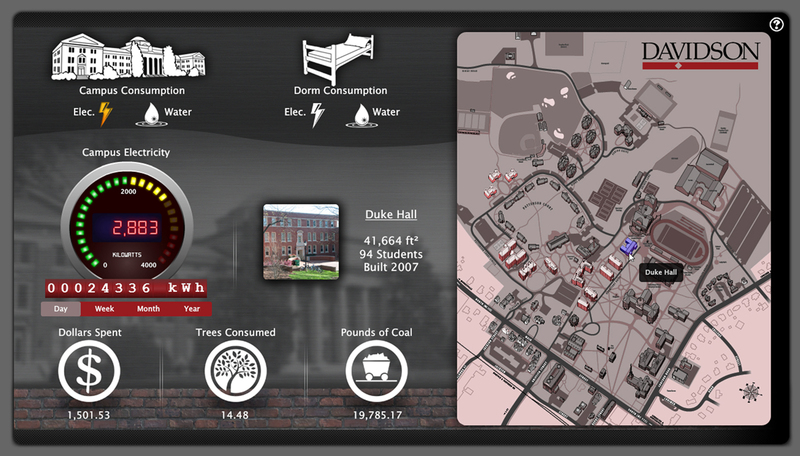 Working as a team partner with Davidson, Activelogix helped design and implement a solution that worked for the college, using Periscope as a platform for discovery, analysis and optimization of Davidson’s energy profiles. “Periscope provides Davidson College with a single tool for campus-wide communication and collaboration among departments to fully engage the entire campus community. It allows everyone on campus to be aware of his or her actions and resulting energy usage so that we can work together toward reducing our utility costs and conserving natural resources,“ said Naisby. With the addition of sub-metered buildings, coupled with the utilization of Periscope, “Davidson hopes to realize substantial energy savings.” Davidson was able to discover relationships between building operations, equipment, weather, and energy usage. The “Do it in the Dark” student energy savings competition was a great platform to see how Davidson could get the student population interested in competing against each other to save resources. Through the use of online energy dashboards (Periscope), students and faculty can see the direct effects of making better and more mindful choices. Davidson College is a highly selective independent liberal arts college for 1,920 students located 20 minutes north of Charlotte in Davidson, North Carolina. Since its establishment in 1837 by Presbyterians, the college has graduated 23 Rhodes Scholars and is consistently regarded as one of the top liberal arts colleges in the country. Davidson stands out as an excellent choice for students who seek a vigorous undergraduate education in a residential environment. Both the town and college were named after Brigadier General William Lee Davidson, a Revolutionary War commander. The land for the college came from General Davidson’s estate, a large portion of which was donated by his son. The college was established by Presbyterians in 1837 and maintains a loose affiliation with the Presbyterian Church (U.S.A.). According to its Statement of Purpose, “the ties that bind the college to its Presbyterian heritage . . . have remained close and strong” and “the loyalty of the college … extends beyond the Christian community to the whole of humanity and necessarily includes openness to and respect for the world’s various religious traditions.”Majors are offered in more than twenty fields; Davidson also offers several minors and self-designed interdisciplinary options.